The property forms one half of a large Victorian semidetached property in Harrogate Conservation area. The only access to the garden is down steep stone external steps from the kitchen, which is dangerous for a young family. 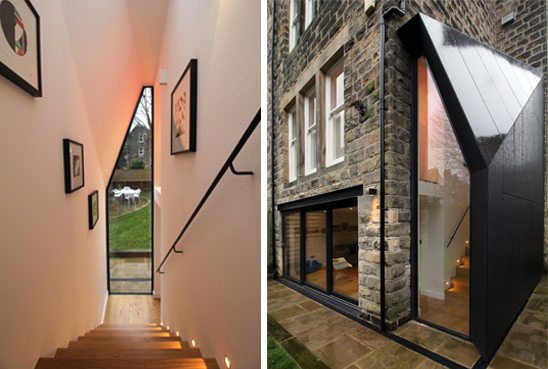 Doma Architects designed a small extension to enclose a stair that provides safe internal access from the ground floor kitchen/dining areas to the basement and garden. The proposal will also open up the lower ground floor rooms to the garden providing a visual link between the two, allowing the young children to play safely in the garden whilst being watched by adults inside. The extension provides a contemporary take on a traditional lean to. It refers to the overhanging soffit/eaves details of the existing house with the glazed wall framed in a crisply detailed overhanging soffit. The extension is to be clad in slate grey fibre cement cladding providing a contemporary reference to the slates of the existing roof.